She was surprisingly little, her black curly head barely topping the level of his shoulder. She had fair clear skin, the kind of skin the old-fashioned songs always compared to rose petals, and her tawny and insolent eyes looked directly into Sader’s face. She was barefooted, dressed in some brief kind of sun suit, a burnt-toast shade that pointed up the color of her eyes. commentary: PI Jim Sader has been hired by a wealthy man to find a missing child: one who was adopted some time ago, but whose fate is in question. He starts uncovering layers and layers of deception and disaster, of sadness and ultimately violence. It is a sad, complex story, not wholly believable, but completely compelling. Sader might sound cliched, but I don’t think he is. Yes he has a drink problem and a dire homelife, and a secret soft centre, but he is a great protagonist to follow around. Not out of you I don’t, Sader told himself. This was an act. She wanted time to think, or she figured he was on the hook and she wanted to play him a little. When she opened the door, Sader saw an elephant of a woman in tight red pants, green jersey blouse, ropes of junk jewelry, and Japanese thong sandals. She was chewing gum. She wore a lot of rouge and mascara. She was nothing at all like Sader’s idea of a society reporter. He’d met a few in his day and they’d all been ladylike ladies in trim suits and white gloves, very conscious of their good manners. This one looked as if she must have retired from a circus. hat was utterly nothing. She’d paid fifty dollars for it somewhere and they’d robbed her. 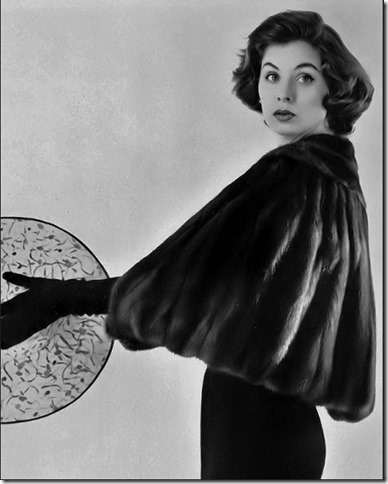 She had on a tan wool dress and a little black fur jacket. There was a frosting of raindrops on her hair. Her lipstick was the color of firecrackers. She was a very thin woman in a wheel chair, wearing a pink silk robe and with a white knitted coverlet about her legs. Gray hair, glasses, and an expression that made Sader suspect her husband gambled or drank, and that she forgave him for it. She had brilliantly dyed red-gold hair and a tangle of bead bracelets, a blue silk blouse tight across the bust and blue capri pants. Then he remembered the calfskin bag. Wrong color. She wouldn’t have carried it wearing the black pumps, so it meant that the killer had caught her in the process of changing, that she hadn’t as yet transferred her personal clutter to whatever purse matched the shoes. a nice house, low and comfortably ranchy without being old-corral about it, not a mansion but as good as the rest of the neighborhood, which was pretty nice indeed. She could really do descriptions, and also characters, and there is a certain good-heartedness wrapped up in the extreme hard-boiled noir. The woman at the centre of the story is barely glimpsed, but memorable and important. I read the book because of posts by two of my favourite bloggers – Sergio at Tipping my Fedora (now sadly inactive) and John at Pretty Sinister Books. I highly recommend both of their reviews, but John’s in particular looks closely at the details that he thinks are significant for the fact that this author is a woman. The writer Bill Pronzini famously called Sleep with Slander, “the best hard-boiled private-eye novel written by a woman – and one of the best written by anybody”, and the quote is repeated everywhere. It is obviously meant as a huge compliment, though makes the modern reader slightly uneasy. But – whatever way you look at it, this is a great book. 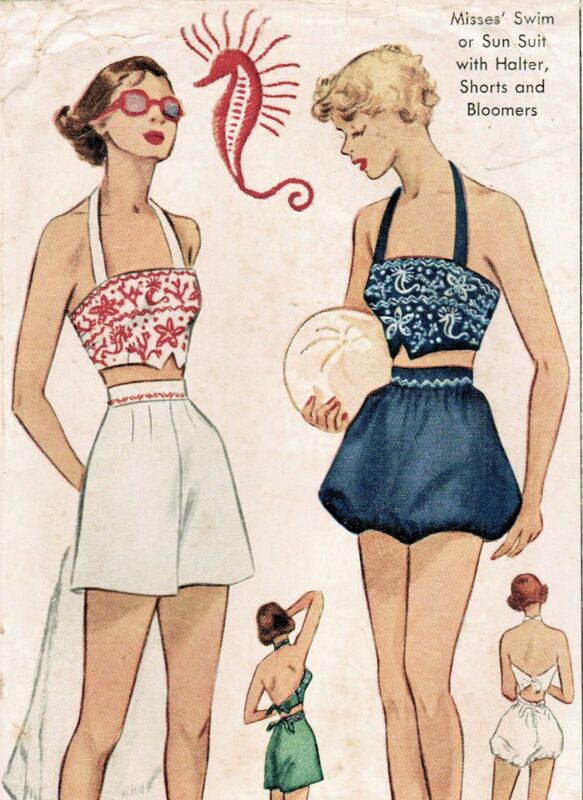 Sunsuit photo from Kristine’s photostream. Fur jacket lady from Kristine’s photostream. 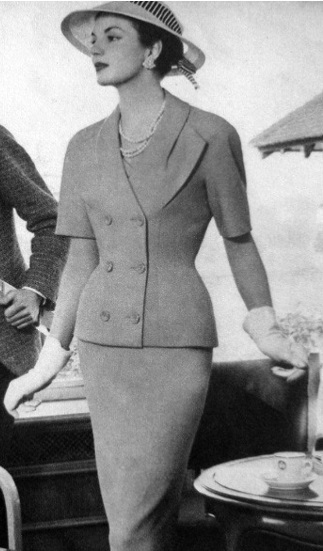 Suit and hat from Clover’s Vintage Tumbler. Capri pants also from Kristine. I know - Sergio's blog was always a joy to visit. And (as always!) this was a great recommendation. This book could have been unoriginal or cliched, but it wasn't, it was compelling, and both a novel and a crimestory. 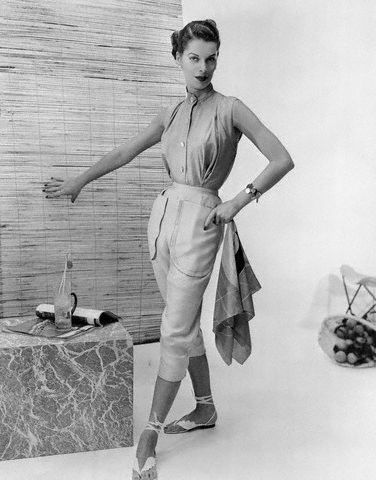 The capri pants lady is indeed wearing Claire McCardell - you are right! (fur coat lady isn't very CMcC). My cup of tea I think. Definitely! Do you have anything by her? Very much your sort of book, I think you'd like it. I thought I had commented here, but ... Haven't read anything by Hitchens but would like to and this sounds good. I have one book by Hitchens, Fool's Gold, in a Library of American volume, so I can start with that. And doesn't look too easy to find other books by her. I will keep looking. I want to read another, must start looking. I'm surprised by how little there is about her online, she is such a good author. Will be interested to hear how you get on with Fool's Gold. I looked for her books later on ABEbooks and found a lot more (and decent prices) so I think there was something messed up in my first search. I will probably still start with Fool's Gold, but it is nice to know I can get more books after that.